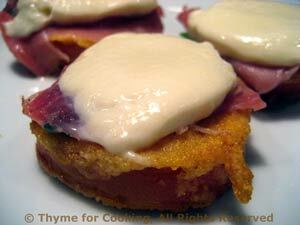 Fried Green Tomatoes alla Romana, easy fall starter, Thyme for Cooking. Okay, so it's not an Italian recipe - but it would be if they'd thought of it.... The last of the green tomatoes from the garden would be perfect, but regular, red ones from the store are fine, also. For a change, we do not want vine-ripened, juicy, red, perfect tomatoes. Cut ham slices in half the short way. Cut 3 1/3 - 1/2" (1cm) thick slices from each tomato (tossing top and bottom). Slice the mozzarella - one slice for each tomato slice. Get 3 flattish bowls or plates. Put flour in one, corn meal in one and the egg, beaten with a fork in the last. Put a large, nonstick skillet on medium - medium high heat. Add oil and heat. With your fingers (or a tongs) pick up one tomato slice, dip both sides in flour, then egg, then corn meal and place in skillet. Fry 3 - 5 minutes or until brown, turn with spatula and fry for 3 minutes more. After turning place 2 sage leaves, a piece of ham and a slice of mozzarella on top of each tomato, cover the pan and cook for 2-3 minutes - until cheese just starts to melt. Transfer tomatoes to individual plates and serve.